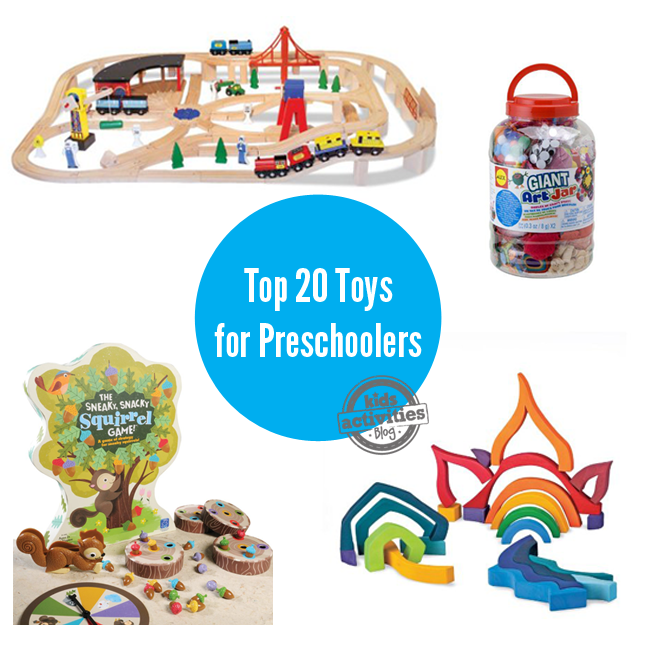 Gifts for preschoolers are so fun to shop for, but there is so much to choose from and no one wants to give something that will end up in the bottom of the toy box. Kids Activity Blog has gathered twenty of the very best gift ideas that are sure to be favorites for years. Mini Micro Scooter: This sturdy scooter is easy for preschoolers to control and enjoy! Balance Bike: Balance bikes are a great way for your preschooler to learn how to ride a bike. Monster Stompers: A fun twist on can stilts, your active kid will love these! Stomp Rocket: Science and activity collide with these super fun rockets! Deluxe Easel: Give your little artist the perfect place to create. Art Set: Everything you need to stock that great easel! Giant Art Jar: It’s like the whole craft store in one big bin! Doll: What would a childhood be without a baby doll? Dress-up Clothes: Preschoolers love dressing up, from super hero capes to fairy wings you can’t go wrong with dress-ups! Train Set: Trains are an awesome way to play, just right for 3 and 4 year olds. Magna Tiles: These building tiles are perfect for your little engineer. Lego Duplo: These larger legos are just right for little builders. Elements Building Set: These beautiful blocks can be stacked an arranged in so many creative ways. Playmobil: Extend the building fun with these super fun figures and scenes. Spot It Jr.: This fun game is sure to be a hit with your preschooler. Squirrel Game: Your preschooler will learn valuable social skills and have a blast playing this game. Pattern Blocks: Follow the puzzle boards or create your own designs with these beautiful wooden shapes. Floor Puzzle: Kids will love to piece together this huge train and practice their ABC’s. Kid Galaxy Robot: This was the best 20 bucks I ever spent! This easy to control robot is my preschooler’s all time favorite toy! 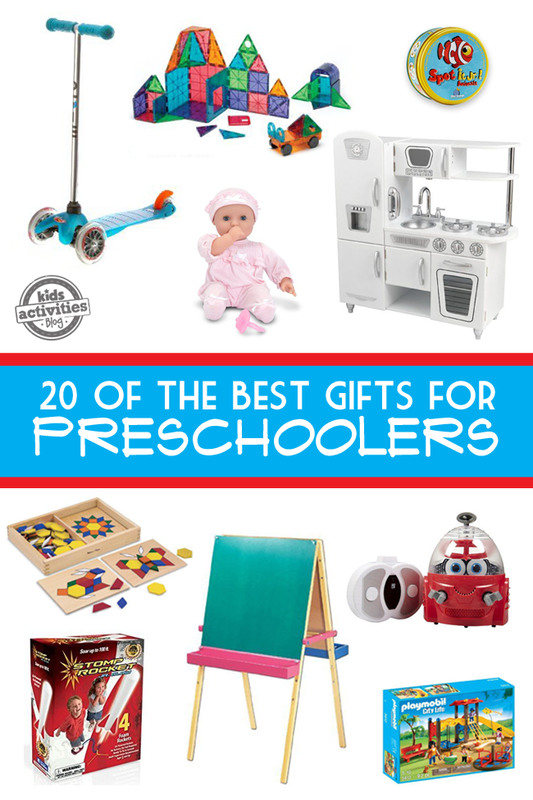 I hope these suggestions help you find the perfect gift for the preschooler in your life!